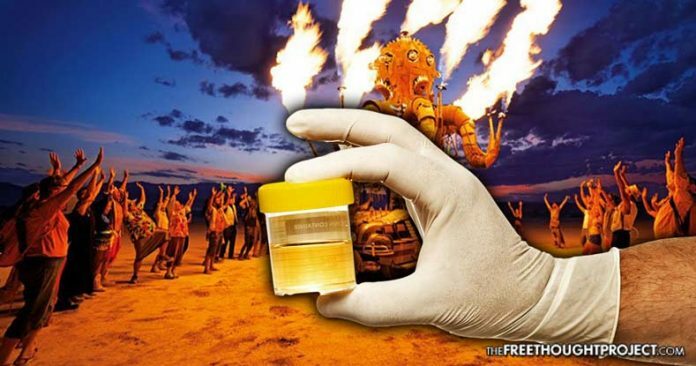 Federal agents announced that they will be drug testing attendees who drive to this year's burning man, entirely innocent people could go to jail. Black Rock City, NV – Music festivals have grown in popularity over the past several years, and to some extent, these events have provided a safe haven for people to party and enjoy themselves. However, these situations have naturally created a target for police who are seeking to generate revenue through drug arrests. This vacation season, art and music festivals are going to be a honeypot for police, who have announced that they will be strongly targeting some of the biggest events in the country, including the legendary Burning Man, which takes place in the deserts of Nevada each year. Burning Man has become one of the most targetted events by police over the years, and the Bureau of Land Management, the federal police force tasked with patrolling the event, has recently announced that they will be drug testing people who will be driving in and out of the event. According to a press release in last month’s “Federal Register,” the BLM announced that they will be drug testing drivers to see if they are under the influence, and they will even be testing for marijuana despite the fact that it is now legal in the state of Nevada. Cannabis Now reported that a mere microscopic 10 nanograms of cannabis per milliliter of urine (or 2 ng/ml of blood) will warrant an arrest at Burning Man. Under these conditions, it is entirely possible for a person to fail a drug test even if they are sober and have not smoked or ingested any cannabis for days. Pershing County Sheriff, Jerry Allen recently admitted to The Reno Gazette-Journal that the vast majority of drug arrests at Burning Man are related to marijuana. Attorney and cannabis legalization activist Lauren Vazquez said that she expects a massive backlash from these rule changes, and pointed out that not much driving takes place at the event anyway, aside from people entering and leaving the festival. “It looks to me like they are setting a standard for drivers on the playa. It does say probable cause is required. This is a rule making proposal and will soon be open to public comment and, hopefully, revisions. Knowing burners there’s going to be a lot of talks. I’m more concerned about the laser prohibition on page four: Never leave home without your laser!” Vazquez said. “It’s only on the playa, and it takes probable cause to search the driver by saliva or blood or urine. Just being at burning man is not probable cause — they have to smell weed, see you driving badly or see you doing drugs while driving before they can test you. So just sitting in line on the way out is safe. At least they wrote in the probable cause standard and we don’t have to argue about that,” she added. Federal police forces have had their eye on Burning Man for several years now. Just last year, for example, the FBI noted in a report that they intended to infiltrate the event to gather information about potential terrorist activity. Apparently, art and free expression can now be equated with terrorism. The FBI report additionally indicates that this operation could target drug users and sellers. “The greatest known threat in this event is crowd control issues and use of illegal drugs by participants,” the FBI report said. It was reported last year that the state of Nevada will be looting the organizers of the world-famous “Burning Man” festival for roughly $2.8 million in a new tax scheme. The new scheme will place a 9% tax on ticket sales for a number of large events. This new tax could force Burning Man and a number of other events out of the state of Nevada.